For sale, lease, or trade!! All offers considered. And business ventures are welcome as well, we support development of this property for mining or recreation purposes. Unique building permit available through Mono County for secluded off-the-grid parcels like this one. 20.67 acres more or less of private land, patented back in 1882 due to massive exposed quartz veins carrying high gold and silver content. If you are here looking for gold, you are in the right place! 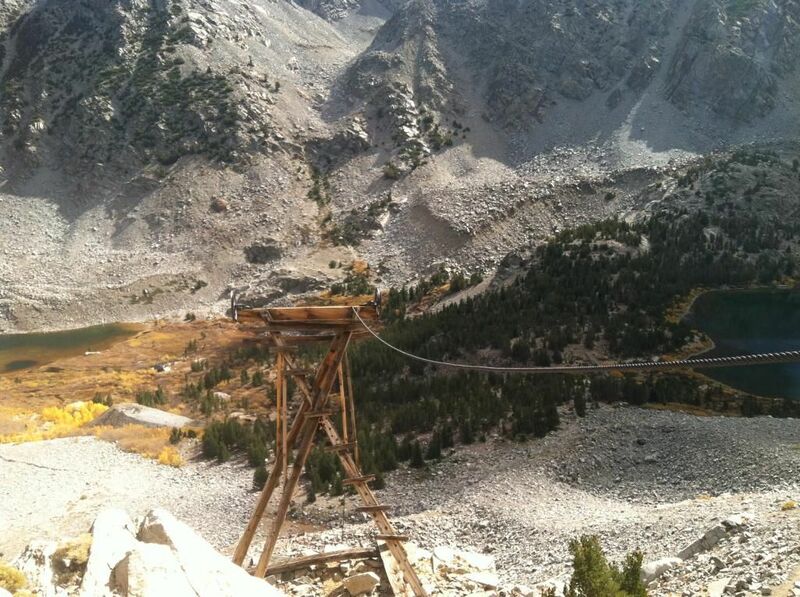 Land locked by USFS Hoover wilderness, Inyo National Forest. Bottom Lake level adit dynamited shut by USFS. Year round water emanating from land. Legal access, our historic road up has been cherry stemmed into last round of wilderness expansion under the guise of that it makes a whopping mountain bike trail! Currently we are allowed access by road and trail by hiking, mountain biking, pack animal, or helicopter. No wheeled motorized use with-out permission, when USFS was asked for permission it was rejected on the basis "it's just reasonable for you all to hike right in." It sure is. 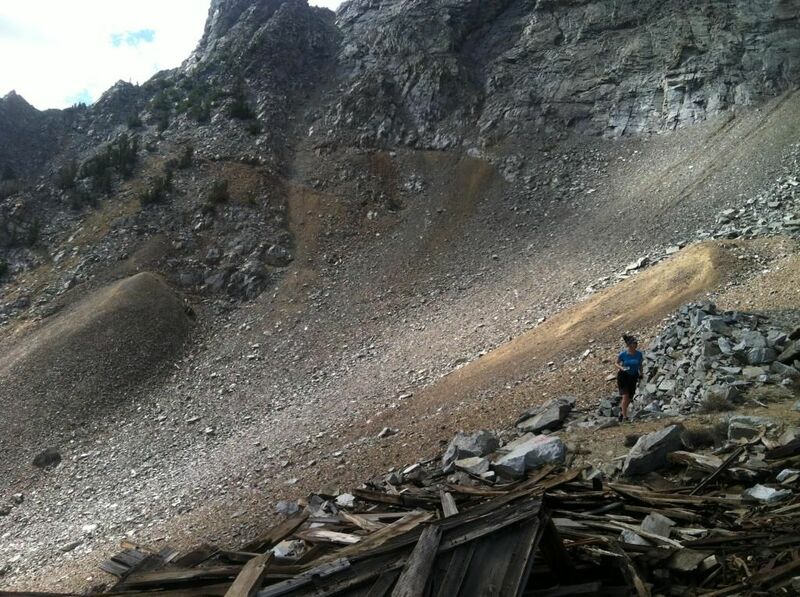 Mine assays and records show over 100,000 ounces of gold still locked in the mountain. Today gold was at $1312/oz. Miles of underground workings at multiple levels. 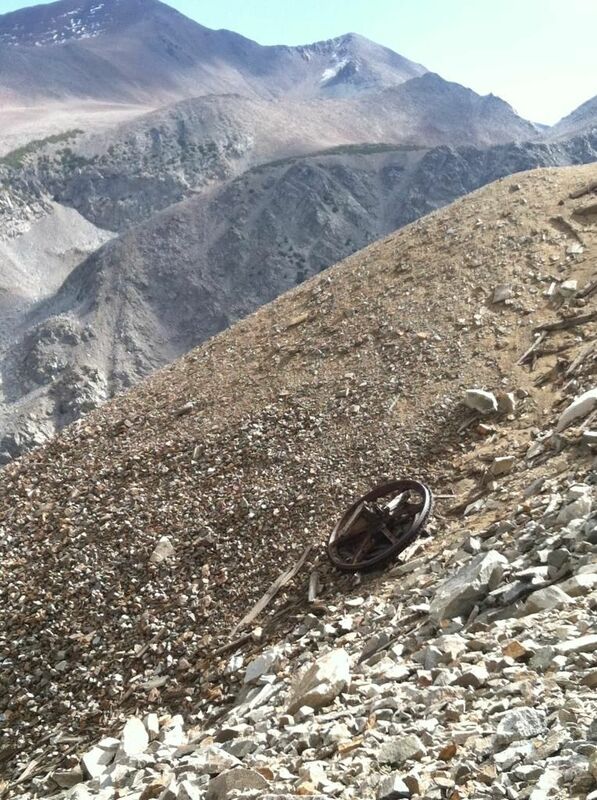 Internet searches may say all the records of this mine burned up in a fire but that's not the case. They rest safe in a fire-proof vault in Reno, NV. Everything. Original patent, Chain of title, Underground maps, Assays, Keys, Surveys, Road survey, Mineralization records, and even a paid tab from Nicely's Restaurant in Lee Vining from those re-opening the lower level back in the 70's and early 80's. In your consideration of this property and perhaps the most relevant factor is that this is extreme high altitude land with dangerous exposure to winter conditions and avalanches. Lake Canyon might very well be more suited to heli-skiing than mining. Eastern Sierra winters are no joke and have been the primary reason for all the failed mining attempts made on this land. 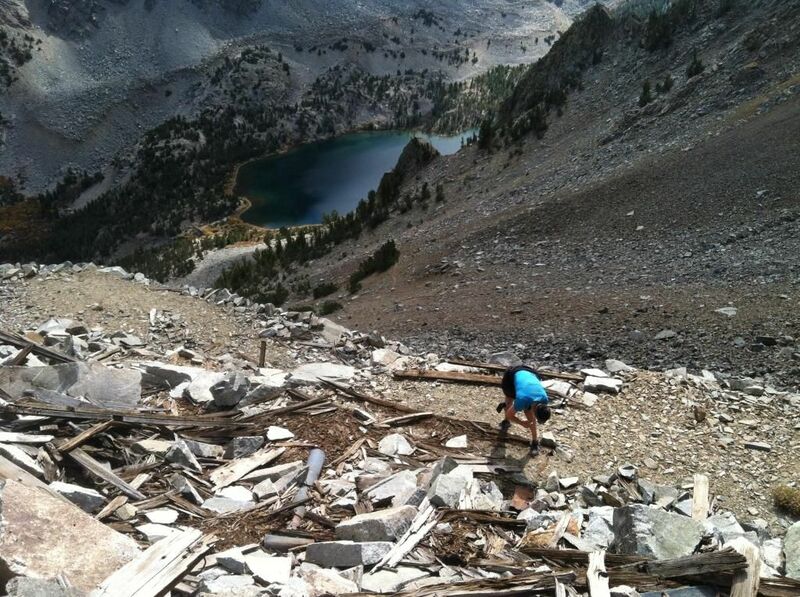 Summers also hold pitfalls for the unprepared even though this is a beautiful unparalleled mountain paradise. I'm putting this out there because Yosemite National Park is a mere 7-8 miles away and every year that park claims unsuspecting victims who had no idea what they were getting into. Please be safe, and aware of changing conditions at all times. Owner financing available to serious buyers. In the below photo Isabel checks out the square nails that held together the bunk cabins and cook-house before a freak spring snow-slide took everything down. At the May Lundy it's good luck to pick up a souvenir, not like at Bodie where it is bad luck. Everyone I know has been taking things forever from up there from the esteemed Sierra Club member to the lowly casual artifact collector. (Govt personnel and maybe you too) No hard feelings, I like hearing how something special now sits on your fireplace mantel in Mammoth Lakes. This was the biggest tailings dump at about 10,777 feet. Over here, it was easy to get light headed due to a combination of stunning views and crisp high altitude air. Not to mention the loose rocks underfoot and high-grade ore in both hands just complicated everything. Looks like someone tried to roll the tram turn-about thingy down the hill. That could be Mt. Warren in the distance. Tram tower here still looking good and avoiding avalanches for quite some time. Crystal Lake to the left, Oneida to the right. Below and to the left is the massive tailing mountain left over from the lake level tunnel. While on the well maintained hiking trail to the upper May Lundy views are all the way to Nevada. Closer up that is Gilcrest Peak across Lake Canyon and Blue Lake down below. This is a perfect example of a glaciated valley with a chain of scoured out lakes and lateral moraines. 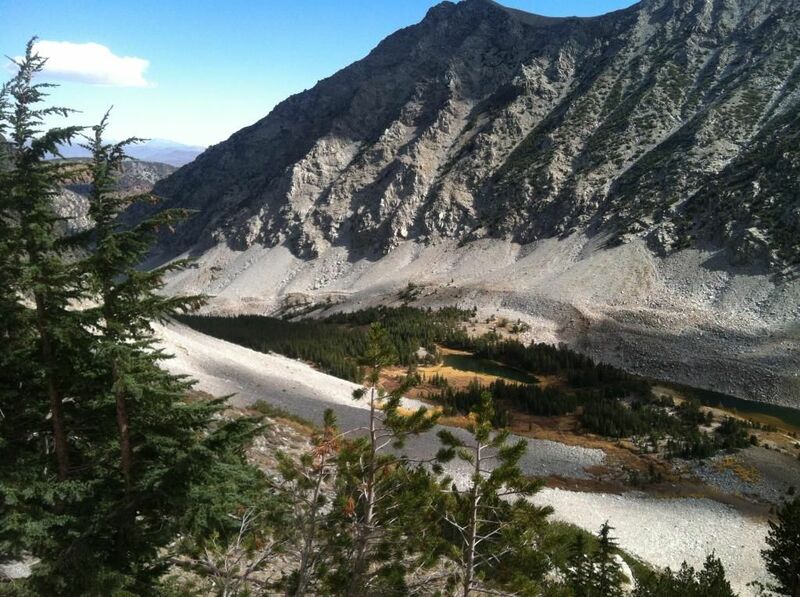 After it was all said and done, this photo below might best capture the 20.67 acres of Mono County land for sale. It's a big amphitheater of mountain-side stretching all the way up to the top (not shown) for those who like a little more flat land under their feet. Because this land is so steep, I can guarantee that there is a lot more than just 20.67 acres of property here. Notice the side cuts, those were the quartz veins that were dug out. 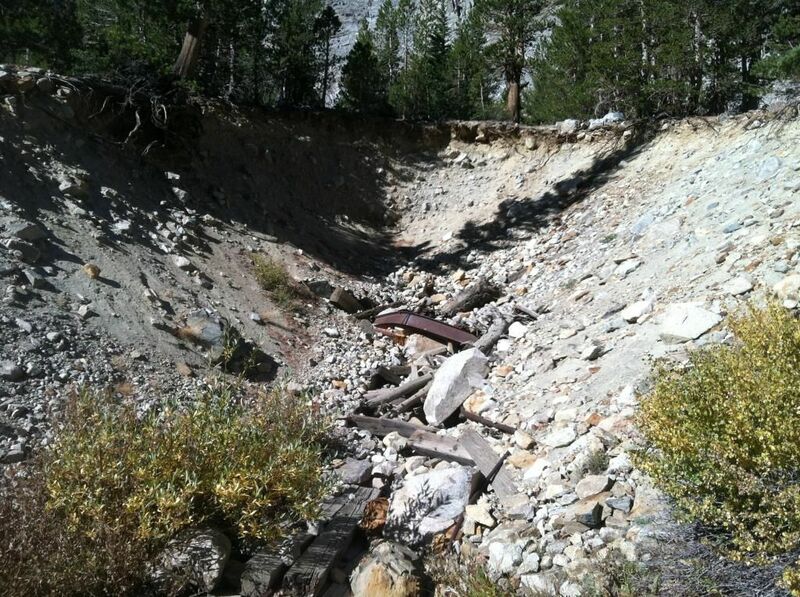 This is what remains of the lower "Lake View" tunnel, also known as the Piercy Tunnel. This tunnel goes in for about 1,000 feet until it gets under the May Lundy Mine. The idea was to meet up with the top diggings and have an easier means of getting the ore out of the mountain and bypass the tram. It was never accomplished but along the way even more promising ore bodies were discovered. An underground mining map will be posted up here when I can secure one. Present day it's now blasted shut, but an easy open for someone handy with a shovel. The mine was closed for safety, I get it. The rumor of bad air didn't scare many adventurers off. By the way, the mine air was great, the flowing creek helped circulate it. I have good stories from those I've talked too, I'll share those in a bit. About $10,000 of track was laid recently to get things going. This creek is pouring right out of the blasted tunnel, moving strong like our streams over at Hilton Creek. Apparently, 100 years ago the miners hit many underground water sources. In the early 1980's a survey crew drilled into the granite and affixed an adapter to channel the water via a hose. That hollow drill bit is still in the mountain and water is flowing all this time, even now after three years of drought. This is from a local credible source who walked all the way back in and verified it. I'll continue to update this page as more time becomes available. In the meantime, there are additional photos and commentary here, (May Lundy Mine photo gallery) if you'd like to follow along on our latest May Lundy Mine field trip. Come along, throw another log on the fire and grab a fresh cup of coffee. Highly mineralized quartz brought down from the upper May Lundy Mine tailings. There's lots of this stuff left and it's easy to imagine the tram buckets being overloaded with such ore. This piece is about 20 pounds and I huffed it down on my back. 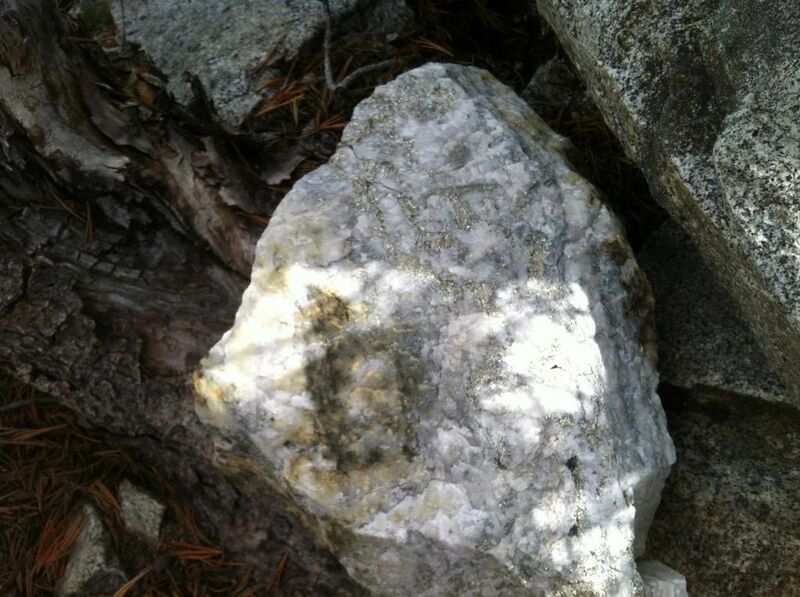 Cinco de Mayo 2015 update - while running errands with my wife in Bishop, CA, I received a phone call from the last May Lundy Mine geologist who spent three summers in the mine surveying gold bearing ores. He found that the last surveys from the 1930's were fairly accurate. One of his more notable finds was a 2" quartz vein that blasted out to a two and a half foot vein that will probably go on for a considerable distance. His observations of the underground workings is that they were all in solid granite so there were minimal timbers needed. Air and water qualities were excellent, a vent system was set up as a precaution against radon gas, a common occurrence in most eastern sierra homes. Also, there was talk and directions of a 'secret' entrance to the mine. Something I will follow up on next time up. Our phone call was cut short, but he was a wealth of information regarding the May Lundy Mine and said it was one of the most unique mines he's ever worked on. The lower levels were never connected with the top ones. He has a good underground mine map, and will forward one on when time permits. The bottom levels are vast, many areas were not explored during his time. The upper levels were not explored either. High Au ore content is ready for removal by a small operation. Environmental advocates will oppose large scale mining, but they freely incorporate mined materials into their daily lives. 2018 summer update - even though the sale of this mine to Mammoth Mountain Ski Area did not go through last year, there is now a May Lundy Mine exhibit on top of Mammoth Mountain (along with other historical sites). Ride the gondola to the top, views are incredible! !